Mount Augustus or Burringurrah is one of the most spectacular solitary peaks of the world's largest monoclines, it rises above a stoney, red sandplain of arid scrubland and is visible from the air for more than 160 kms. The granite formation is about 8 kms long, covers an area of 4,795 hectares and is estimated to be 1,750 million years old. The area around Mount Augustus is the traditional lands of the Wajarri tribe. Burringurrah is the Wajarri name for Mount Augustus. Aboriginal occupation is evident by the engravings on rock walls at Mundee, Ooramboo and Beedoboondu visitor sites. 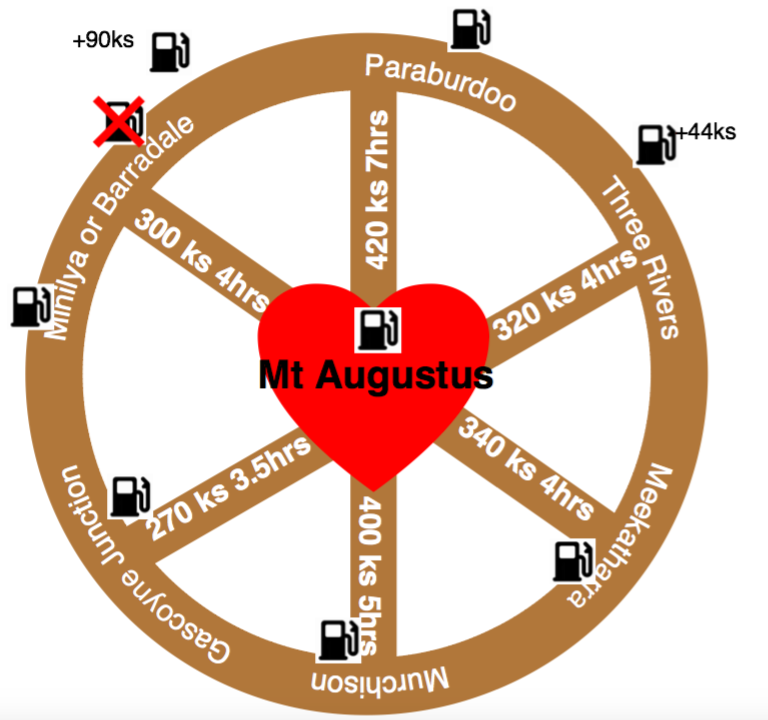 Mount Augustus is 430 km from Carnarvon via Gascoyne Junction and 360 km from Meekatharra. Roads are gravel but suitable for two wheel drive vehicles. Roads may be closed or substantially damaged after heavy rain. Before travelling, seek advice from the local shires. Carry ample fuel, water and supplies to cope with all possible occurances. information provided on other web sites regarding travel times are hugely inaccurate. The mud map to the left provides more accurate information on travel times and distances. No camping or open fires are permitted within the National Park or on Mount Augustus Station pastoral lease. The temperature ranges from mid 20° celcius during the winter up to the mid 40° celcius in the summer. The nights can get quite cool during the winter although they are warm during summer. Rain season is heaviest during December to April as this is cyclone season in Western Australia. To check for current weather you can go to www.accuweather.com and click on the Mt Augustus link.